Typically, there is a certain degree of pain or discomfort you can expect following surgery. Surgical procedures are traumatic for the human body, and pain may be attributed to your body trying to heal injured tissues. In some instances, however, nerve pain develops afterward and this isn’t the same kind of pain you should probably expect. As we’ve noted throughout our website, nerve pain is often marked by symptoms like burning, shooting, stabbing, and searing pain. For some patients, external stimulation—even at low levels (like wind blowing over skin or water coming down from a showerhead)—causes intense physical sensations. Others experience “pins and needles” or feel as though a specific body part or region has been plugged into an electrical outlet. If you have those kinds of symptoms, the pain is likely caused by a nerve issue of some kind. In some cases, these symptoms begin after procedures like C-sections (cesarean section deliveries) and tummy tucks. When they do, it’s understandable for patients to wonder why this is happening to them. So, let’s look today at why you are having nerve pain after those kinds of procedures. To start, it is worth noting that nerve pain does not imply that anything was done incorrectly during the surgery. Surgeons, by very definition of their job, have to cut tissues to repair medical problems. Your body has an entire network of nerves running throughout, so this means there are times when nerves will also be cut during surgery. It’s just a fact. As with other surgical procedures, it is virtually impossible to perform a C-section without cutting into some nerves. That said, long-term nerve injury after a C-section tends to be somewhat rare. Often, nerves will heal without causing any lasting issues. When injured nerves do not heal correctly, it is considered to be nerve damage. Depending on which nerves are damaged—and their respective functions—there are various short-term and long-term symptoms that can develop. These symptoms can include impaired motor function and nerve pain. If you have had a C-section and are experiencing a superficial pain around the edges of the scar, it is likely the ilioinguinal, iliohypogastric, and/or genitofemoral nerves have been affected. Usually, the pain presents as a burning pain and hypersensitivity – which means even light touch hurts (like in the earlier examples of wind and water). There may also be “electric shock” sensations. If pushing on the affected area does not reproduce the pain, those specific nerves are less likely to be responsible. The reason for noting the ilioinguinal, iliohypogastric, and genitofemoral nerves comes down to their locations. Surgeons do attempt to avoid important nerves as much as possible, but these ones run close to the edge of a C-section incision. This makes it easy for them to be injured during the procedure (bruised, crushed, etc.) or trapped in scar tissue afterward. If you are having painful sensations, it is more likely the nerves were injured, instead of being cut. We can say this because cut nerves tend to produce numbness instead of pain. Although, there are times when both numbness and pain result from cut nerves (which is a condition called anesthesia dolorosa). When diagnosing your nerve pain after a C-section, we use a nerve block. This is a matter of using anesthetic to cause temporary numbness for the affected nerve. When there is both numbness and pain relief, it indicates a peripheral nerve injury. If there is numbness without pain relief, something else is likely at play. Tummy tucks—abdominoplasties—are some of the most common cosmetic procedures performed in the United States, with the American Society of Plastic Surgeons reporting 127,633 in 2016. This is a 104% increase from the 62,713 performed in 2000. 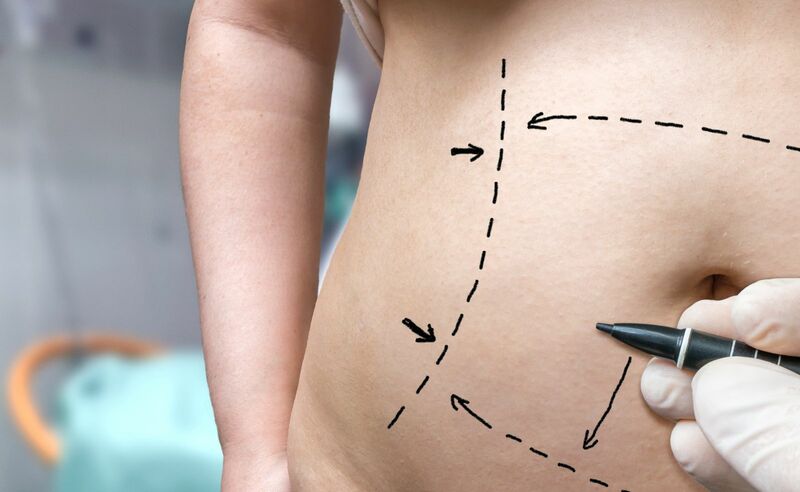 Experts believe the number of abdominoplasties will only increase due to both the number of esthetic surgical procedures and increase in how many obese patients achieve massive weight loss following bariatric surgery. As with other surgeries, nerves to the affected area are traumatized from a tummy tuck. This can cause numbness for several weeks to months before the nerves overcome temporary neuropraxia (loss of nerve conduction). Usually, it only takes around 6-12 weeks for the situation to resolve, but there are cases wherein this may take longer. Whereas this numbness and a certain degree of discomfort can be expected, it can be a problem when nerve pain has developed and is not going away after a reasonable amount of time. In the case of nerve pain following a tummy tuck, it is probably a small nerve called the lateral femoral cutaneous nerve that is affected. This particular nerve travels directly through the areas manipulated during a tummy tuck and could easily be injured directly by a suture or scalpel, or indirectly when the nerve becomes entrapped in scar tissue. That said, it is important to note that factors other than nerve damage could be responsible for pain and sensory abnormalities. For example, massive weight loss can cause extreme skin expansion and a patient who had undergone bariatric surgery may also have had other issues (secondary fibrosis, hernia) corrected during the tummy tuck. When you have nerve pain following surgery—particularly if the pain has been present for an extended period—you deserve to find out what is responsible. In the case of C-sections and tummy tucks, it could be inadvertent nerve damage. If so, we may be able to provide the care you need. For more information, or to request consultation with our Baltimore, MD office, give us a call at (410) 337-5400.